This article is a continuation of my previous article “Who Are You” posted on this website on 20th December, 2018. In that article we learned through the teachings of Gurbani that we are neither physical body nor mind, but rather we are pure, compassionate Awareness. With the help of Gurbani we also established that this Awareness in us is the Divine Presence and is called Guru, Satguru, Hari and by many other names in Siri Guru Granth Sahib (SGGS). Now we will investigate what it means to know that we are Divine. Some readers might be thinking how does it help me to know this in my everyday life? This article addresses the significance of this understanding. First and foremost, the significance of this understanding is that it brings God close to us. Normally, we think God is everywhere but may not have any idea that he is closer to us than anything. Even that is not true. He and we are not two separate entities. Only He exists. We don’t have any independent existence of our own. It may feel unnerving to think that we do not have our independent existence. But, what it really means is that we do not exist as body/mind but we exist as the Divine Being. In fact, it is a sort of promotion for us from being body/mind to being consciously aware of ourselves as Divine Being. We should keep this new identity in mind all the time and operate in life from this new center. Not recognizing our true identity is the single biggest obstacle in our spiritual progress. As long as we are stuck identifying with our body/mind there is no way we can find the Lord. Guru Ji says that unless we go beyond our mind we cannot get rid of maya and as such cannot find the Lord. "When the mind is mastered/transcended, the illusion of the objective world of maya is eradicated. Without going beyond the mind, how can the Lord be found?" So it is imperative for us to focus on our true identity. Do we want to stay stuck to our old and false identity of being body/mind or do we want to adopt our new and true identity of being Divine. Gurbani tells us over and over to be a Gurmukh rather than a manmukh. Being a Gurmukh means connecting with the Guru/Divine presence in us. And, of course, manmukh means thinking our self to be body/mind. Guru Ji has echoed the theme many, many times in SGGS that we should try to be a Gurmukh. There are over two thousand Shabads in SGGS, singing praises of a Gurmukh. 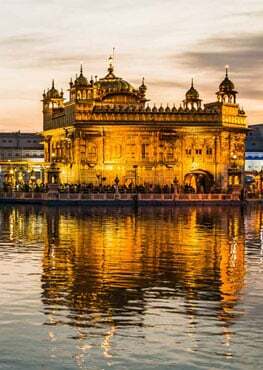 In the following shabad Guru Ji says that if one raises himself to the level of a Gurmukh, he will have a lived a spiritually profitable life while the manmukh will leave this incarnation after wasting his life. "The Gurmukhs have had a profitable life while the self-willed manmukhs leave the world after losing even their principal." The other significance of this new understanding is that when we embrace it, we will see peace and happiness grow in our everyday life. There is a natural law that our life reflects our state of mind. Whatever we think ourselves to be, the life presents itself to us in conformance with our thinking. Guru Ji says that as people think, so they carve their way in life. Based on their actions they come and go. "As is their awareness, so is their way. According to the account of our actions, we come and go in reincarnation." It is extremely important that we pay attention to what we think. The life will present itself to us according to our thinking. If we think our self to be the body/mind, the world will appear to us as fleeting, perishable and impermanent, but if we know and live in our true identity, the divine presence, then life will appear to us full of love, peace and happiness. Guru Ji says that a manmukh finds no peace while a Gurmukh is wondrously joyful. "The manmukh finds no peace, while the Gurmukhs are full of peace." Not only is the Gurmukh joyful, Guru Ji says that Ambrosial Nectar rains on the Gurmukh and he tastes it in his mouth. His mind is rejuvenated as he sings the praises of the Lord. "The true nectar rains down, and trickles into the mouths of the Gurmukhs. Their minds are forever rejuvenated, and they naturally, intuitively, sing the praises of God." Another significance of this understanding is that we come to recognize that we are all One at our Source. We are just different precipitations of one Divine Presence. We have adopted a name and form to play a designated role in this life. Guru Ji says that from One Divine Light whole world has come into existence. Nobody is good and nobody is bad. "From the One Light, the entire universe welled up. So who is good and who is bad?" Once we live in the constant awareness that we are all One, then all hatred and jealousy leaves us and love and friendship fills our life. Guru Ji advises us to see everyone in the world around us as Divine. This new understanding makes inroads into other aspects of our life. It eliminates ego from our life. We understand that the Lord is the only Doer. It is only He who is the Seer, Listener and Speaker in us. One of the most intriguing aspects of this new understanding is that by living with this new identity we do not get entangled in new karmas, so we stop burdening our life with new karmas day after day. This is what Guru Ji says about it. "Chant 'Sohung' 'I am That'. He is not affected by either virtue or vice." The one who chants “I am That”, the effects of virtue or vice do not stick to him. Living with this understanding does not mean that we stop doing anything and become a recluse. On the contrary, Guru Ji instructs us to go ahead and lead our normal life with our new identity of being one with the Guru. In fact, Guru Ji says that this is the perfect way to live the life. "O Nanak, meeting the true Guru, one perfects the technique of living. One attains salvation while living this way whilst laughing, playing, dressing and eating."